Illuminati Lighting Venus single light ceiling pendant features a large circular design ceiling plate in polished chrome finish with thin suspension wire holding a cylindrical beveled shaped translucent iridescent glass shade. 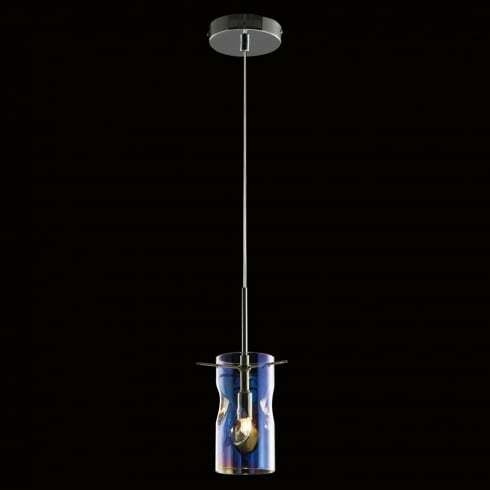 This attractive ceiling fitting allows bright halogen light to shine through the iridescent glass, accentuating the multui coloured effect and is a stunning addition to modern or contemporary rooms within your home. Height adjustable at point of installation. This product code is MD13028079-1A MULTI. The Venus collection includes a matching 3, 5 or 9 light pendant, single light wall fitting,5 or 3 light flush ceiling fitting and single light table lamp and is also available with champagne glass shades which can be viewed on our website.